In the previous post part-1 I explained the initial setup of starting a Server on PC on a port , setting the Windows firewall to allow the port for external communication , PORT FORWARDING set up in the Router config, etc.. 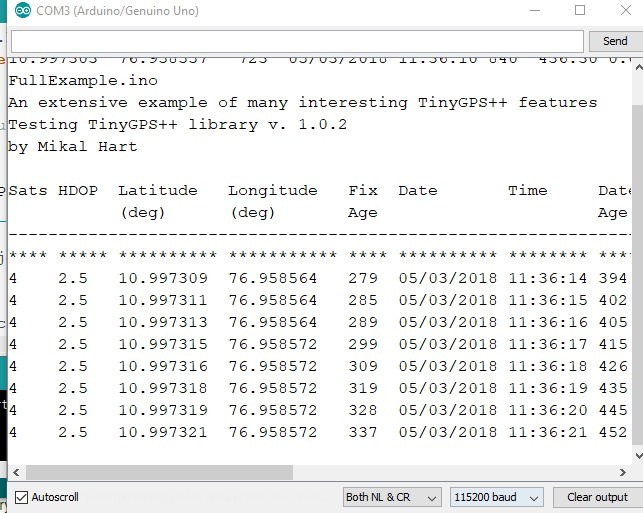 In this part 2 I’ll show a practical demo of sending Temperature data to the Server. As given in part 1 , start a server on distant PC on port 350 & do the port forwarding settings in Router config as explained. 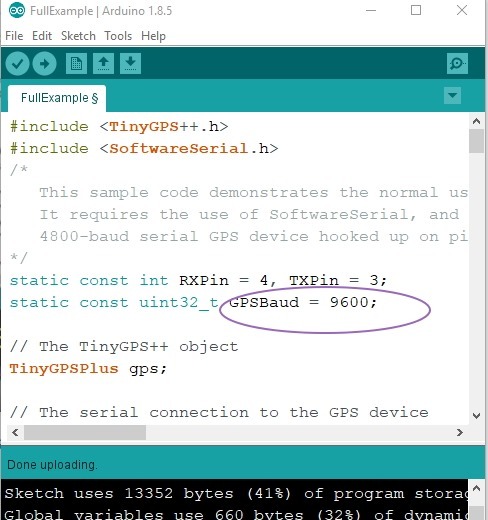 A LM35 sensor is connected to pin A0 of Arduino & a GSM SIM900A is connected to pins 7 , 8 , Gnd of Arduino. As Soft Serial library is used in the code , pins 7 & 8 are declared as soft Rx & Tx. 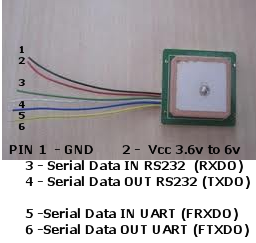 The Rx pin goes to Tx of GSM , Tx connected to Rx of GSM , GND is made common.An external power source of 12v 1A is used for the GSM. The Analog pin A0 is assigned as tempPin to read the LM 35 sensor data. This is essential to start a fresh TCP/IP comnnection. This takes a little moment , so a delay of 6 secs is a must in the code. Following is the screen shot at the Server side. This tutorial is of 2 parts. 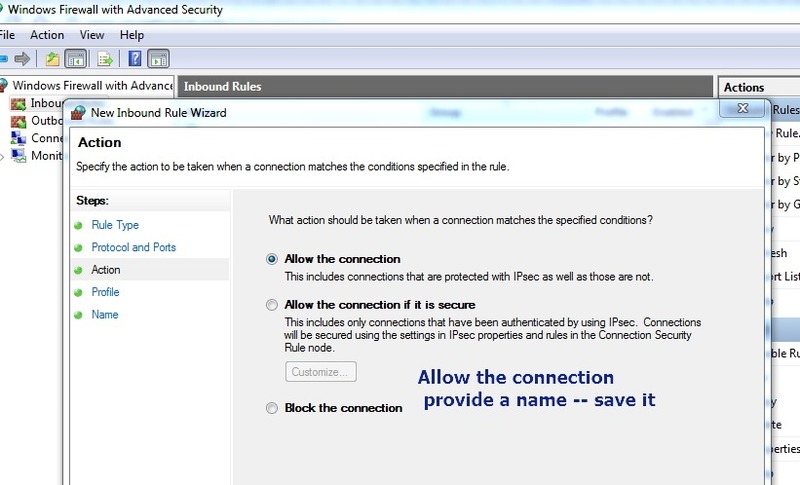 — Windows Firewall setting has to be done for a NEW INBOUND RULE allowing port 350 for communication. 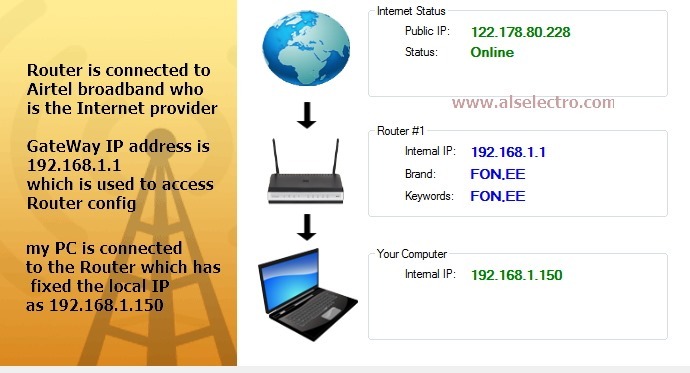 — For connecting to this port from external world , PORT FORWARDING to be done in Router’s Virtual Server setting so that any contact to the public IP is routed to the PORT 350 . 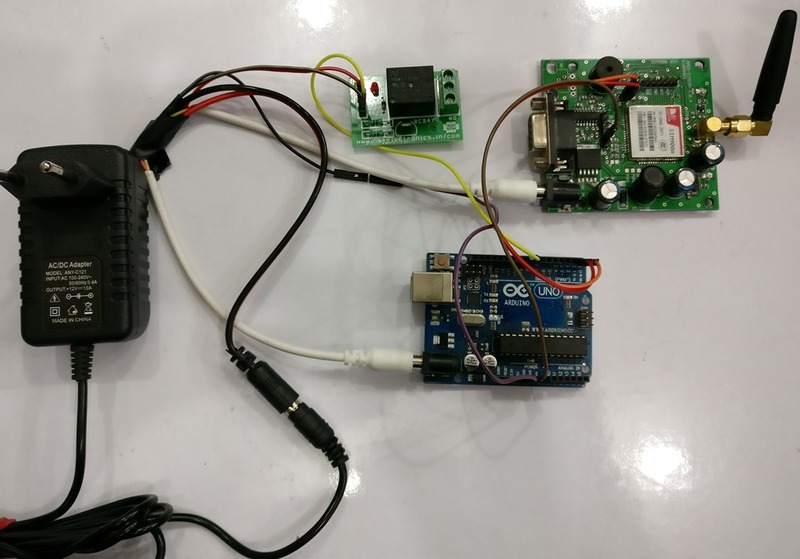 Second part is practical demo using GSM SIM900 or ESP8266 with Arduino. This is the IP by which external world can contact my network. Note that all these IP addresses are DYNAMIC & changes every time I power up the Router. 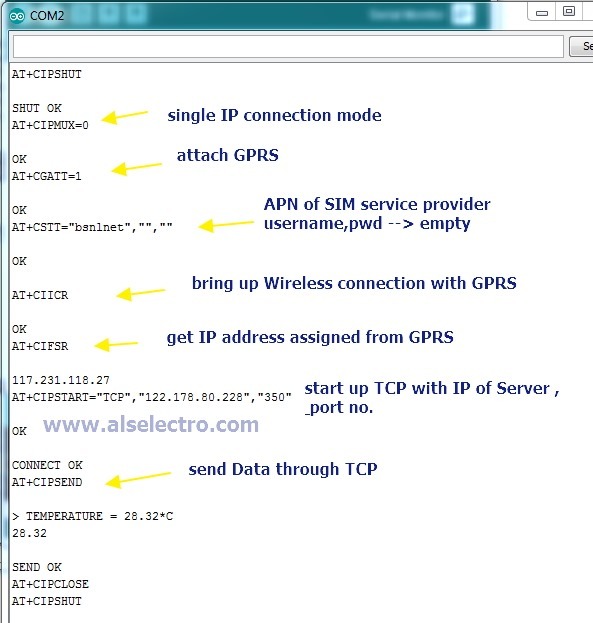 In another post I’ll explain how to make these IP addresses STATIC , so that the IP remain the same always. All the Network Tools I’ve used for this demo can be downloaded HERE. 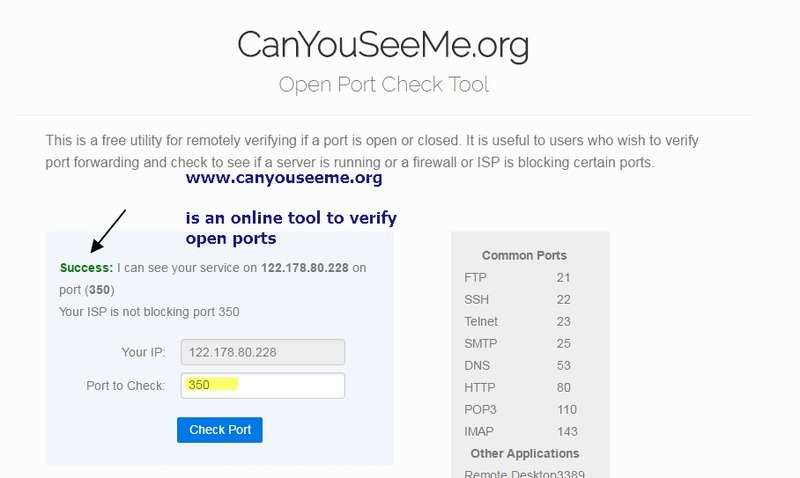 Let us start a server on port 350 using the SOCKET TEST tool. 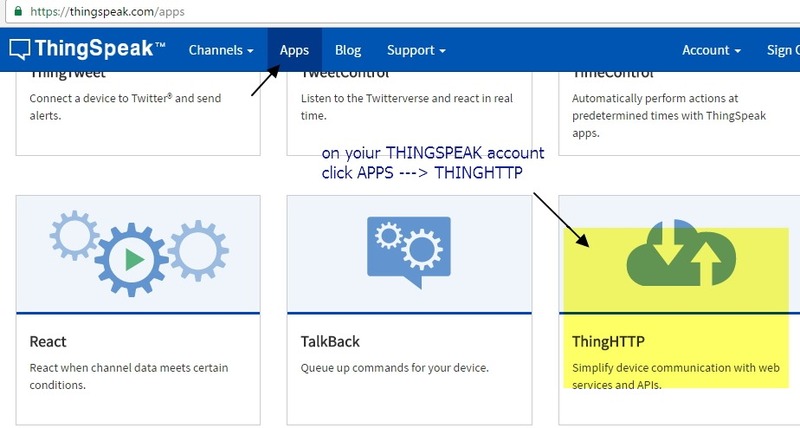 This tool allows us to start a server easily.Click on the SERVER Tab & then feed in the port number where you want to listen. Now the server is up & running.It starts listening on port 350. Remember to avoid the standard ports like 80 ( http) , 21 (FTP), 23 (TELNET), 22 (SSH) ,etc which are well known ports ,pre assigned for the particular protocol. The dynamic range of port number you can assign goes up to 65535 or 2^16-1 (16 bits). 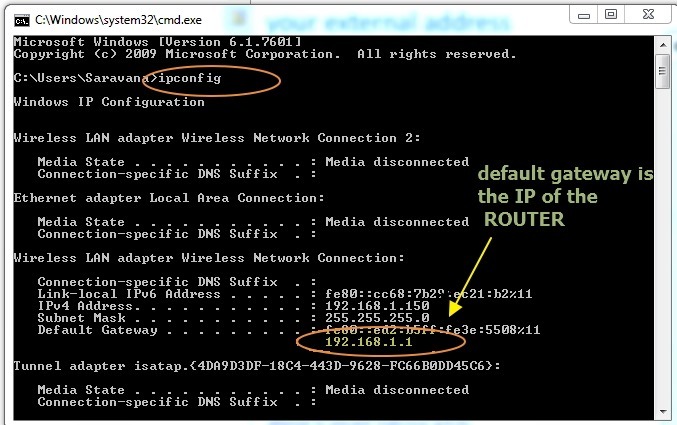 The Default Gateway IP is the address of the Router. 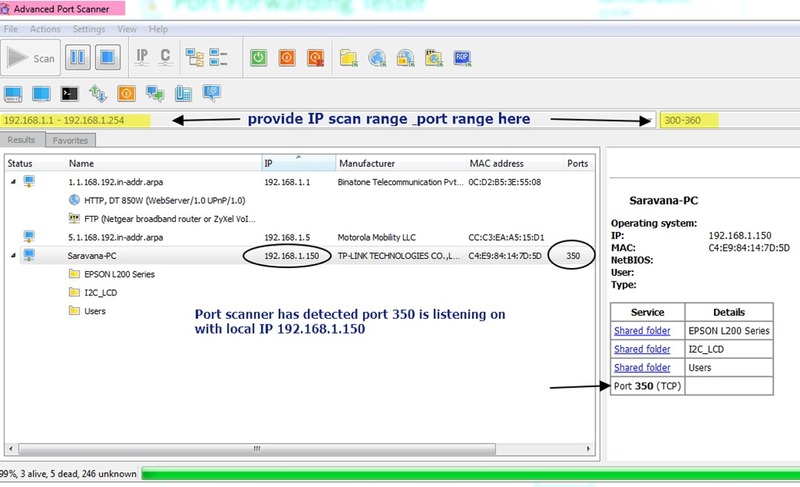 Once the port is assigned for the server , you can use the ADVANCED PORT SCANNER tool to verify the port on the particular IP. 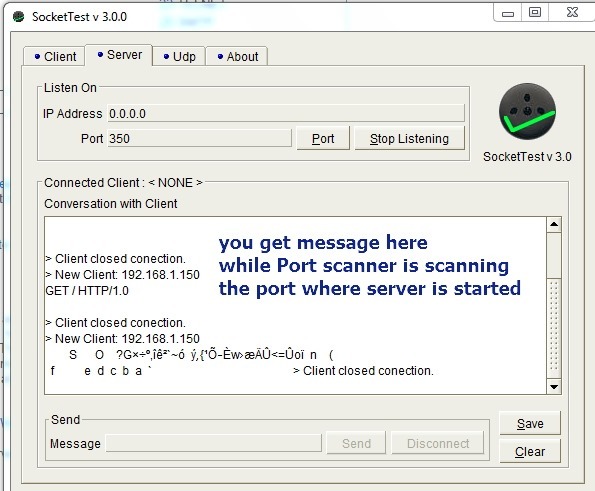 While the port scanner is scanning , you get messages on your SOCKET TEST window. 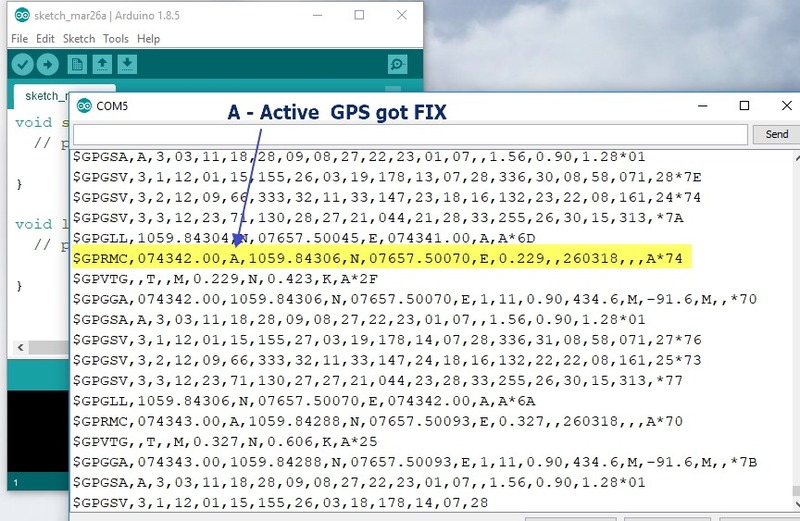 Here you can see the Port scanner software connecting to the port & then disconnecting after scanning. 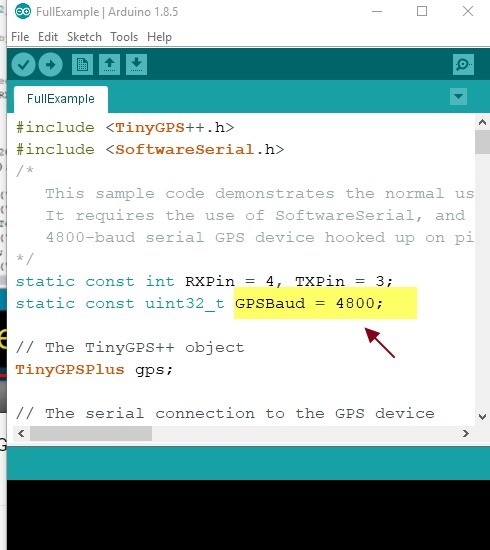 Alternatively you can use a PUTTY serial port tool to test local communication. Click on open , to see the New client connection on the Socket test window. 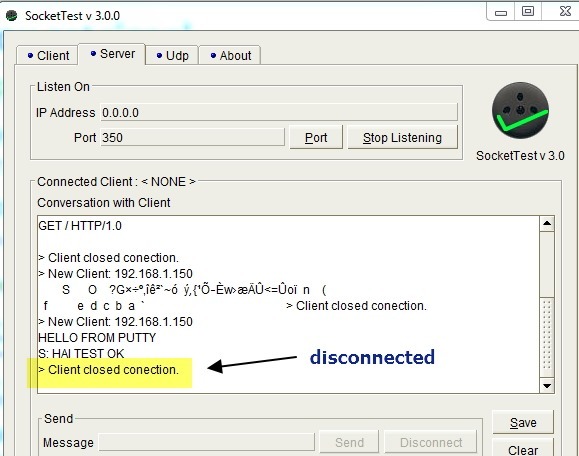 Now you can test two way communication between socket test (server) & putty ( client). The Windows Firewall settings has to be done to allow the port 350 to listen from outside. Open the Windows Firewall & Advanced Security window. 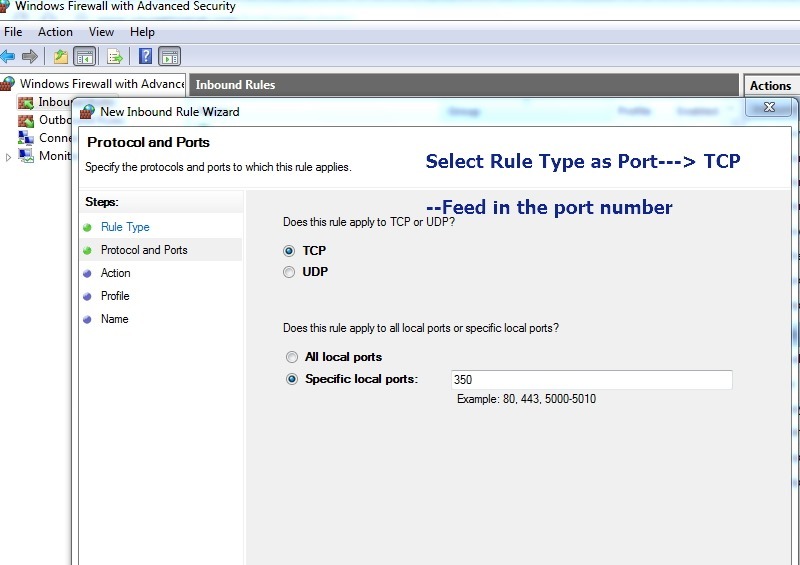 Select the Rule Type as PORT & in the next screen select protocol as TCP. Next window is Profile window , here tick mark all – Domain,Public & Private. Provide a name to the Rule & save it. Now your PORT 350 is allowed to listen by the Windows Firewall. This step is final where you redirect the incoming request to the port number of local IP where the server is started. Here my local PC’s IP is 192.168.1.150 & server is started on port 350. Anyone from external world connecting to my public IP has to be directed to the port 350 on local IP 192.168.1.150. This is called PORT FORWARDING , which is very widely used in CCTV Remote viewing & in Gaming. The setting has to be done in your Router. 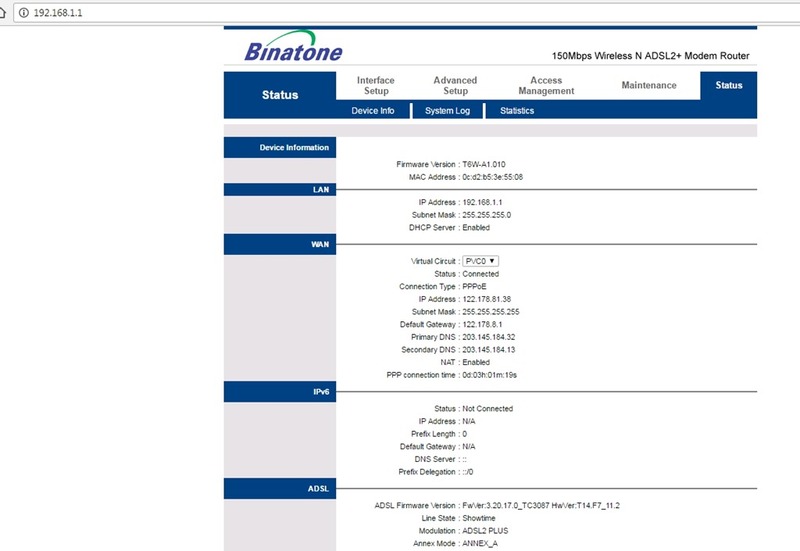 Type in the Gateway IP of your Router , here it is 192.168.1.1 , on your browser & provide the user name & password. You’ve to search for something called VIRTUAL SERVER on the router setting. — Port number , which is 350 .Enter same number at all fields like start & stop. Once saved , the port number 350 is open to outside world. 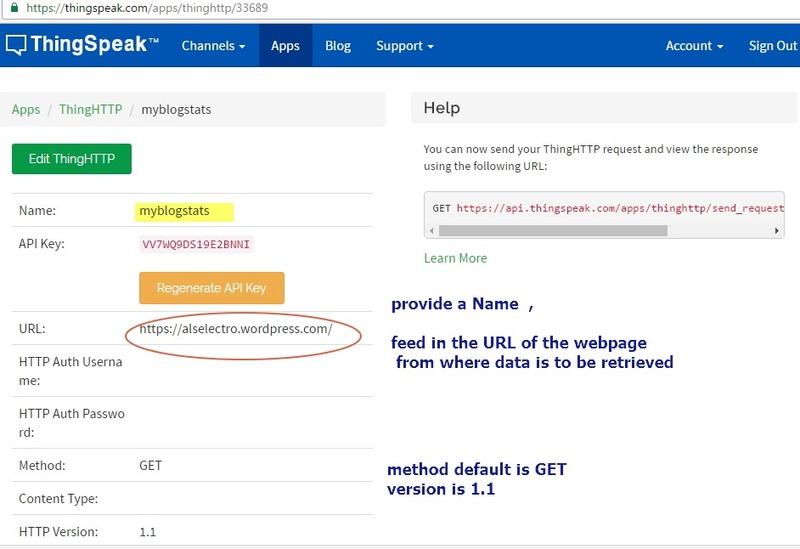 Once you open the link , your public IP will be automatically shown. Fill in the PORT number to be checked & click on CHECK button. 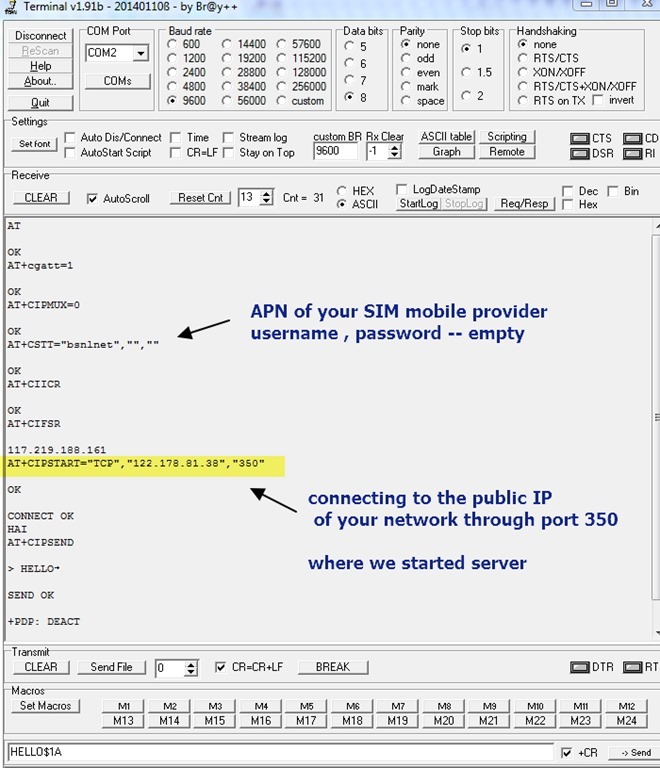 Following is the list of AT commands used by the GSM SIM900A to contact the server. 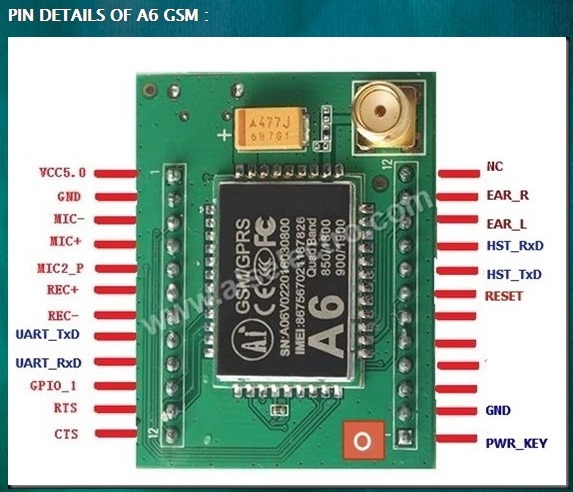 A6 GSM is introduced by the makers of ESP8266 , AI-THINKER. 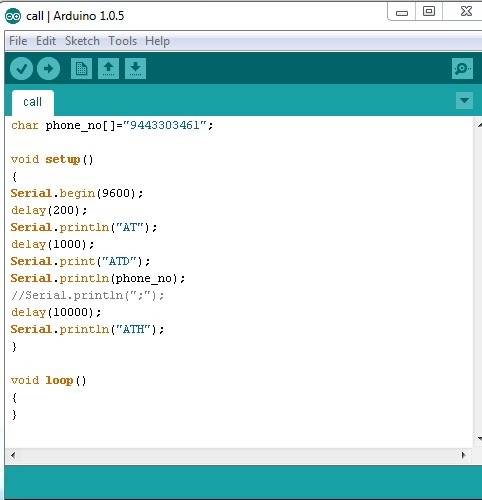 The module is much cheaper than SIM900 & connections are quite simple.In this post we shall see how to connect with Arduino to make a call & send SMS. 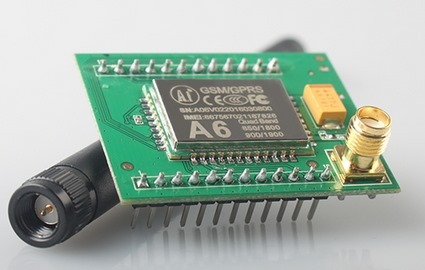 A mobile adapter is enough to power up the A6 GSM module.The Vcc pin of GSM must be looped with PWR_KEY pin.This acts as a chip enable.You can leave this connected or remove after a moment.The module just requires a HIGH trigger at PWR_KEY pin while started. A valid SIM is used at the back side of the module.The SIM slot provided is for a Micro SIM.If you ‘ve a Nano SIM you need to use a converter to fit the slot. 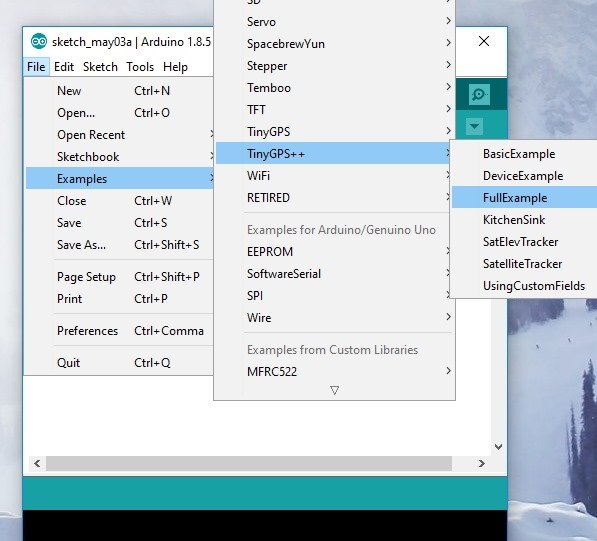 The TxD pin of A6 goes to Rx of Arduino. GND pin of A6 to GND of Arduino. 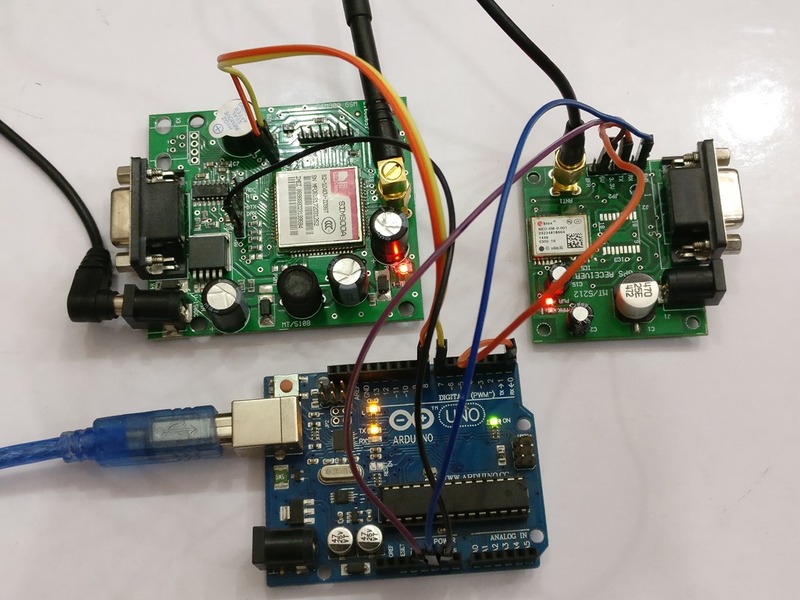 Power up the module & then after a moment make a call to the SIM number used in the GSM module from another phone.If you get the RING Back tone , it means the module is ready.As there is no LED indication provided , this initial step is required to confirm working. 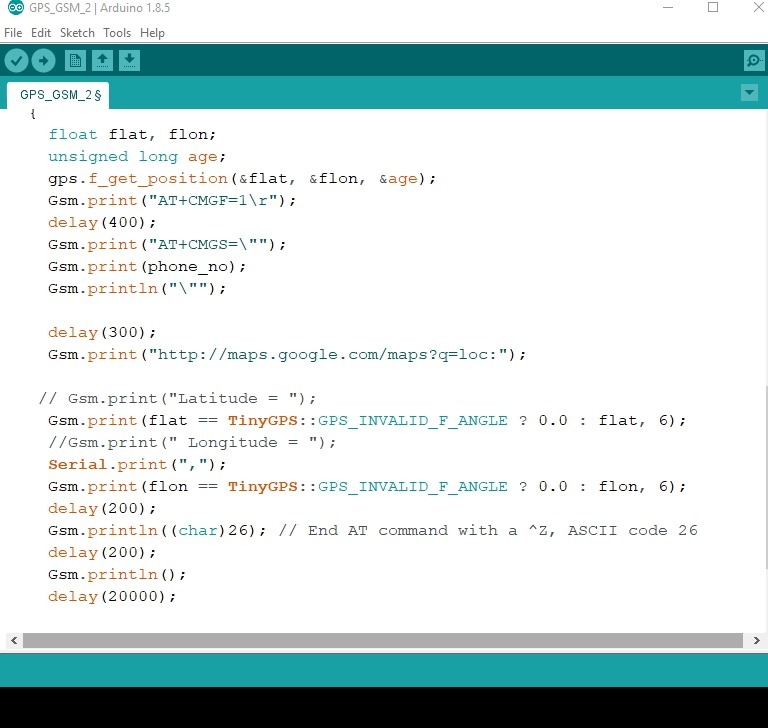 Connect the USB cable of PC to Arduino & upload this code for making a call.Remember to disconnect connections at Rx/Tx before uploading the code. The mobile number to be called is stored in an Array of char variable. 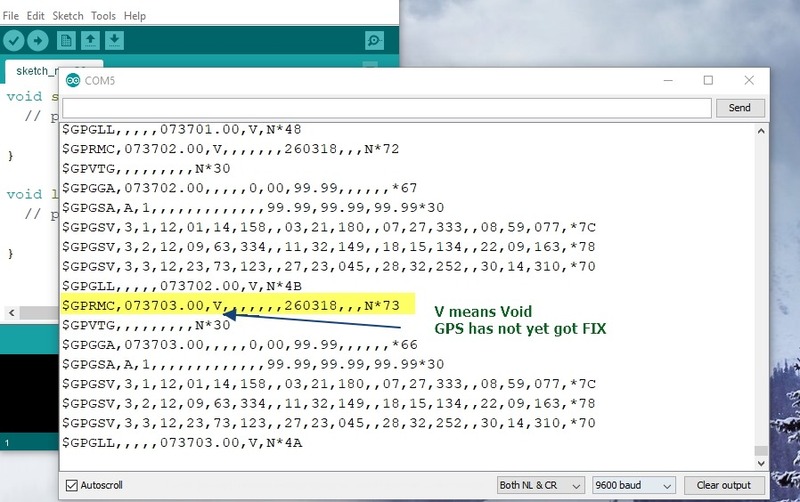 In the void setup() code we begin Serial communication at 9600 baud.Though the default baud rate of A6 GSM is 115200 , it is effective to use 9600 baud . 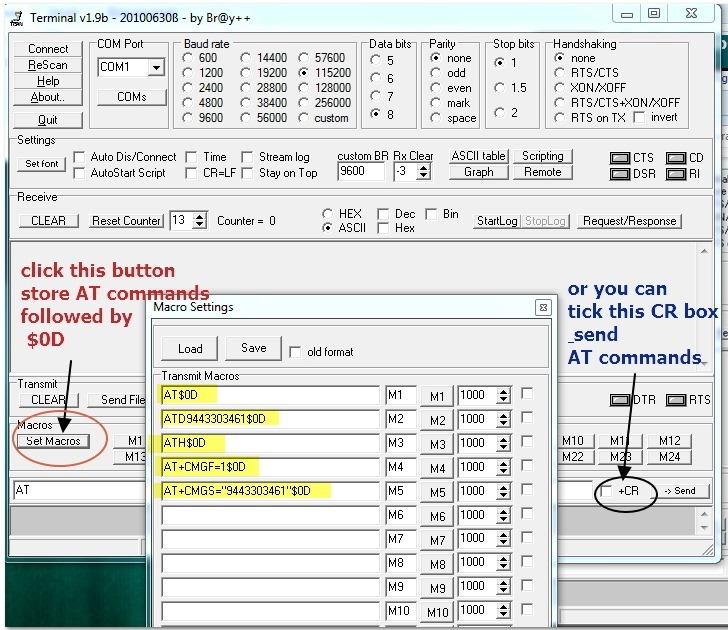 ATD command followed by the number to be called is used to make a call. 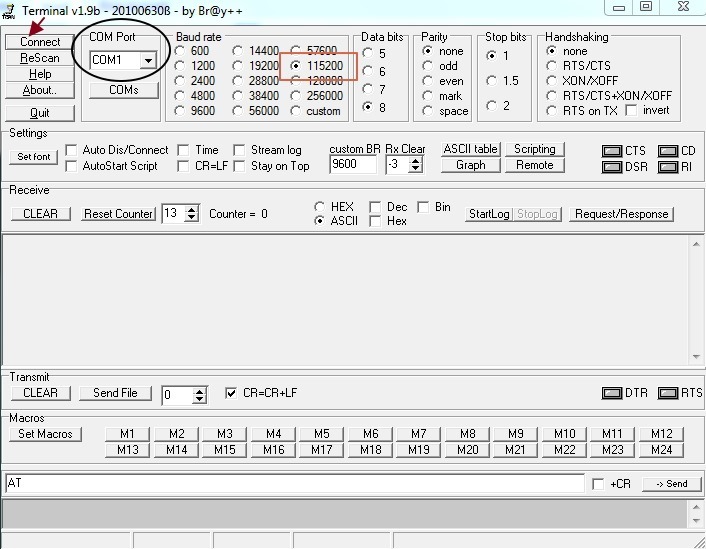 A semicolon at the end is not a must as in SIM900.The call will be made even if you do not use a semicolon. After a delay of 8 secs ATH command is sent to terminate the call. 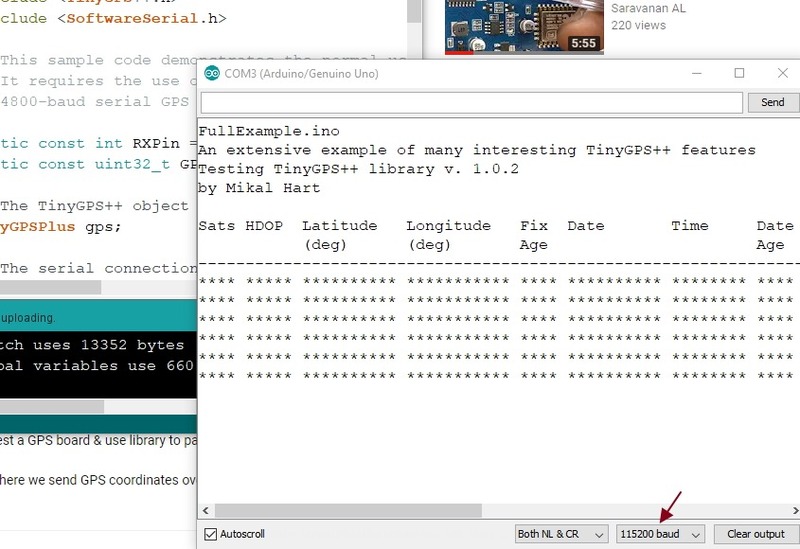 You can open the Serial monitor of Arduino & watch the AT commands landing.You should set the baud rate as 9600 in the Serial monitor as well. 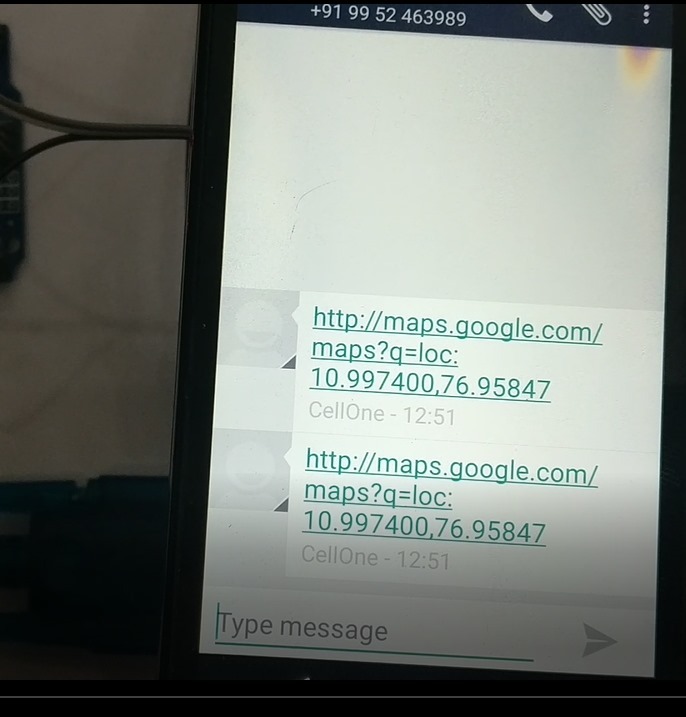 Now let us see the method to send SMS. 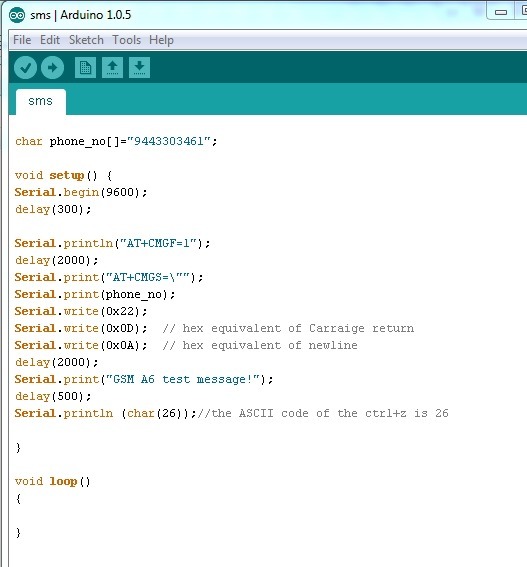 Following screenshot shows the code for sending SMS. 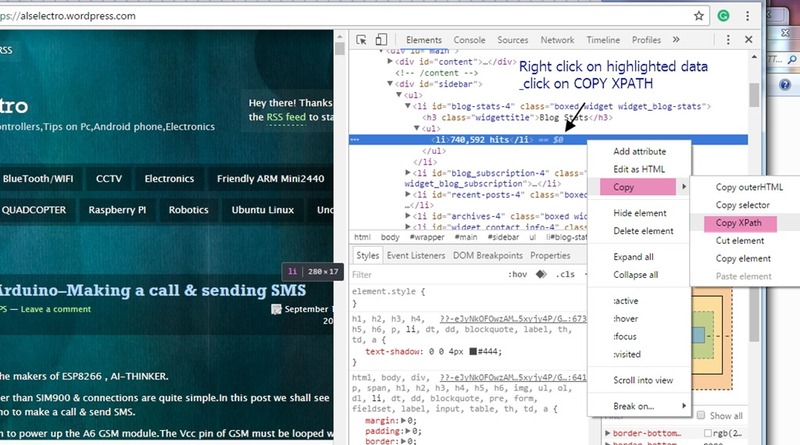 which will allow you to read and write SMS messages as strings instead of hexadecimal characters. Serial.println is used to send the AT command with a New line (Enter). 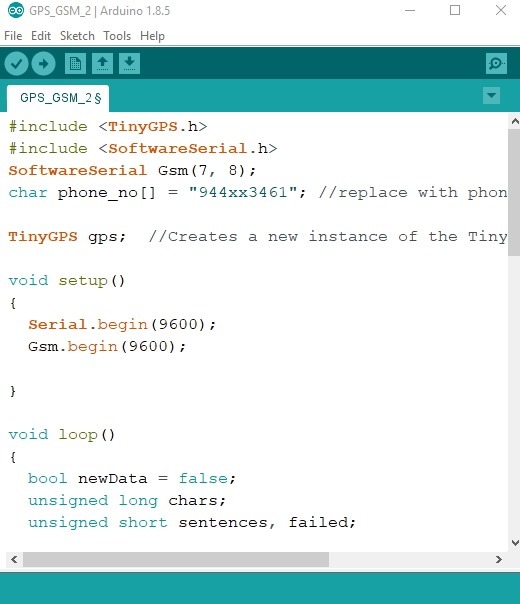 Serial.write(0x22) which is the ASCII equivalent for double quotes. 0D followed by 0A are the ASCII equivalents for CARRIAGE RETURN & LINE FEED. Try this code without the delay , you won’t get response. After the 0D , 0A a delay of 2 seconds is provided & then the message to be sent is given. CTRL+Z is finally given to send the message. 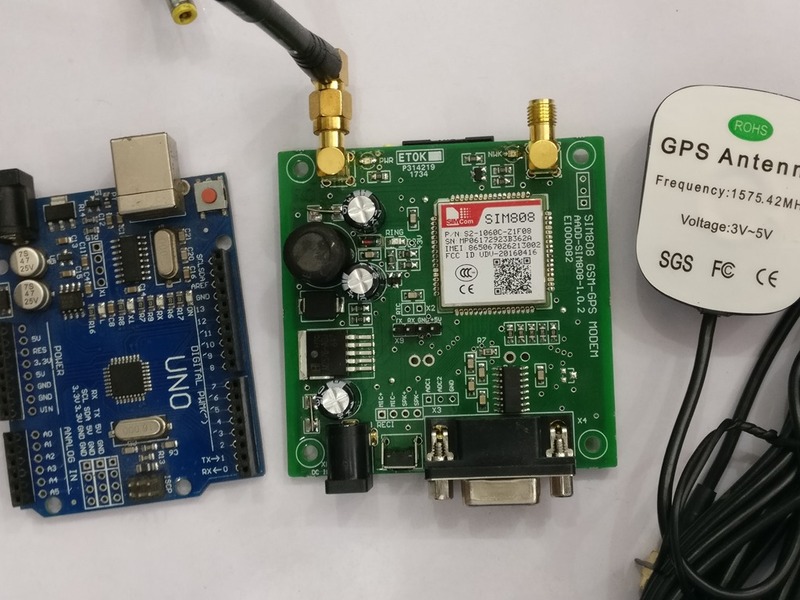 After the huge success of the ESP8266 IOT modules , the AI-THINKER company now introduces the new GSM Module A6.In near future this module will be available at half the price of SIM900. 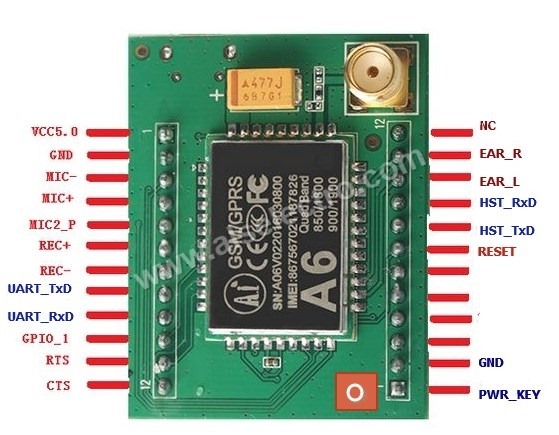 This is mini GSM / GPRS core development board based on GPRS A6 module. It supports dual-band GSM/GPRS network, available for GPRS and SMS message data remote transmission. – Baud rate: 115200bps and it can also be set by AT command. 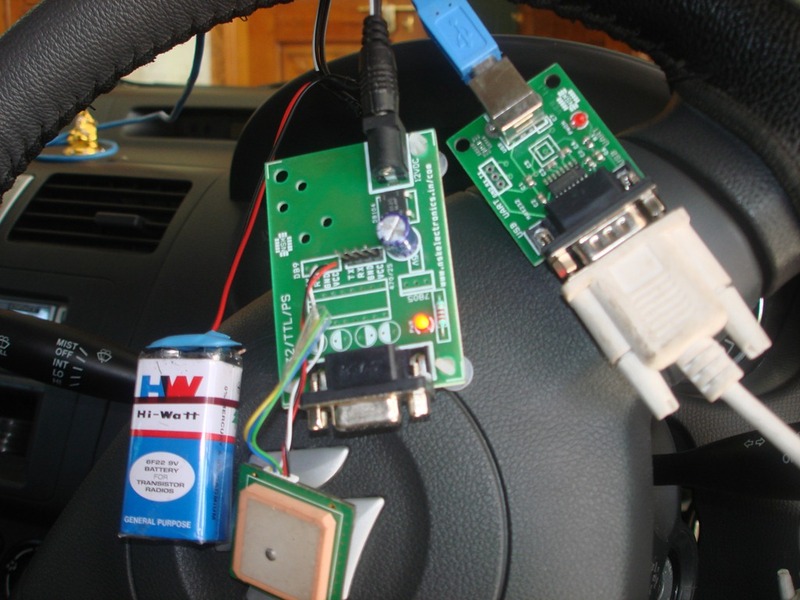 – Make and answer phone calls using a headset and electret microphone. – Send and receive SMS messages. 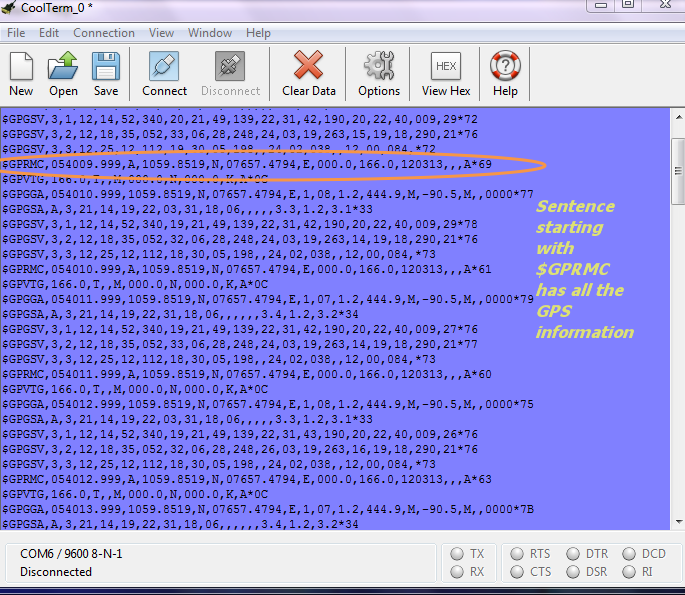 – Send and receive GPRS data (TCP/IP, HTTP, etc.) . To test the module we make use of an USB-TTL module built on CP2102 . The A6 GSM can be powered up with a cell phone charger for which a mini usb socket is provided at the back side.Its advisable to use 5v 2Amp adapter. Insert a valid SIM to the SIM holder seen at the bottom side of the module. 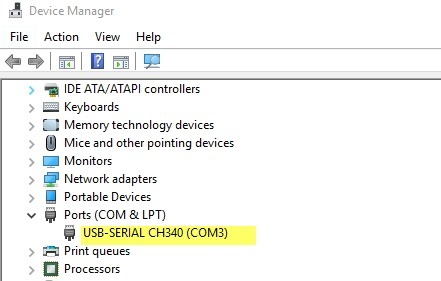 Connect the USB-TTL board to the PC & open the Device Manager to note the COM port alloted. 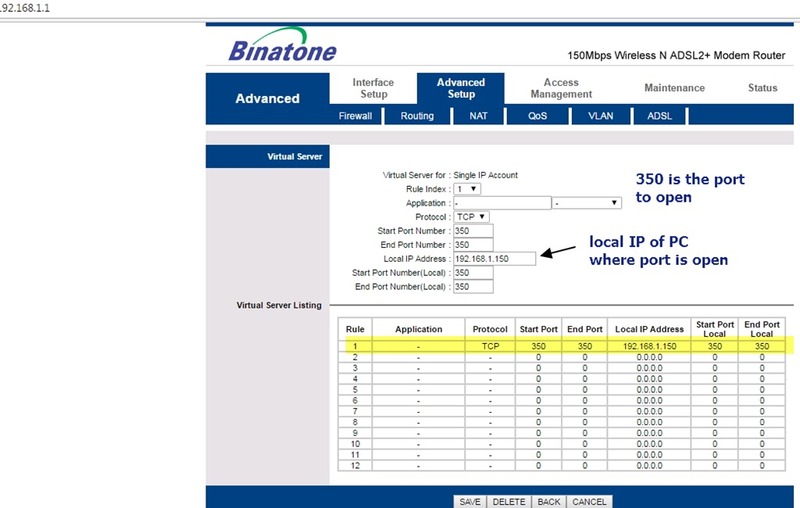 Open the TERMINAL Software & select this port .Select baud rate as 115200 & click connect. The GSM module takes around 10 secs to boot up & finally you get CREG 1. Now you can type in AT commands.The GSM A6 module requires a Carriage Return after every AT command .You can tick mark the CR found at the bottom right of Terminal before sending any command.Or you can make use of the SET MACROS function .Here you store the AT commands followed by $ sign & then 0D . The $ sign is to Append & the 0D is the ASCII for Carriage Return. 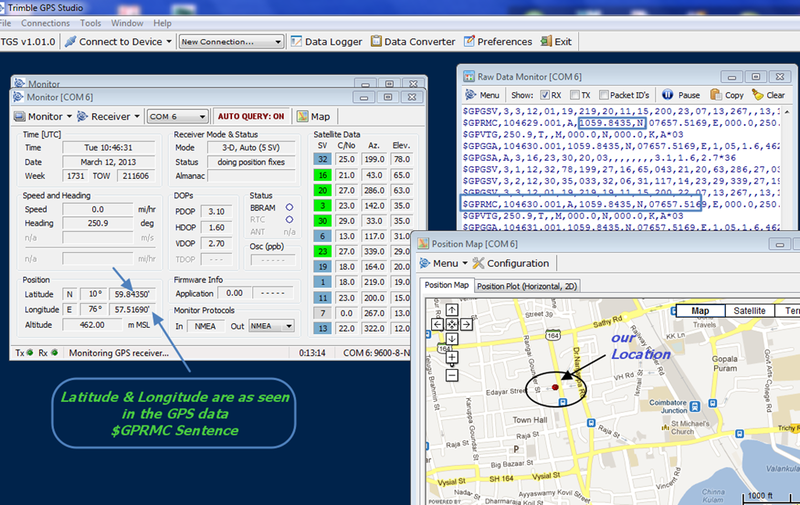 AT commands are stored in M1,M2,M3,… as shown in screen shot above. Now if you click on M1 , AT command is sent with CR & you get OK response. Clicking M2 will send ATDxxxx to dial a number . The semicolon after the number is not a must as in SIM900. Now you get a > symbol & the module waits for you to type in the message. 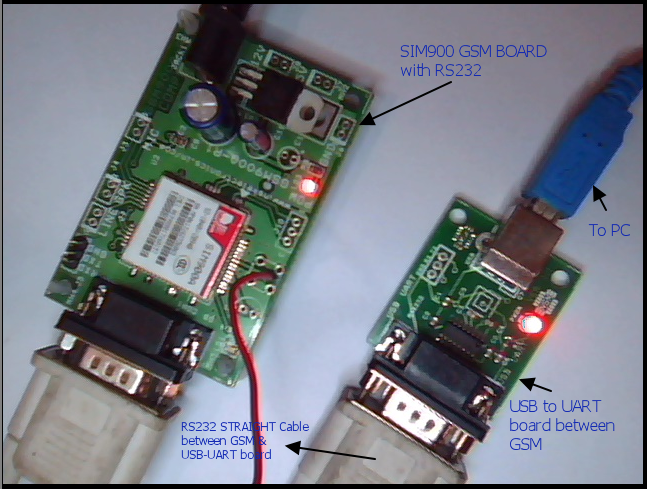 This post is intended to illustrate the received SMS by a GSM module like SIM900.AT commands to handle the received SMS are explained in detail. We shall use a SIM900 module on RS232 breakout board & an USB-UART converter board to connect it to the PC. 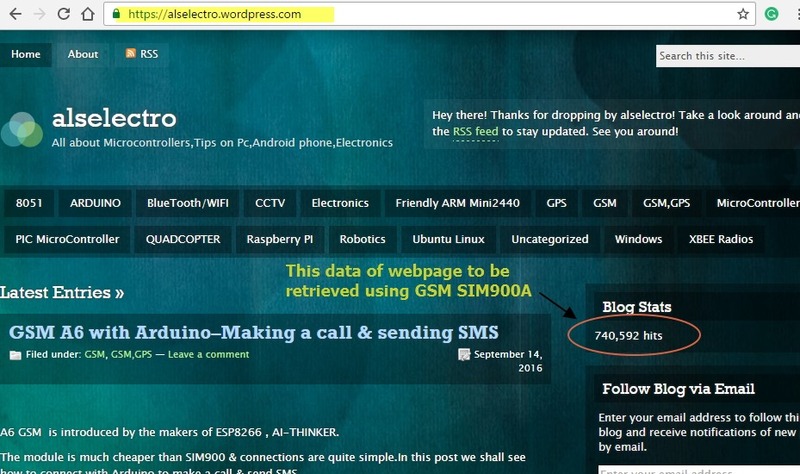 Following is the setup to test received SMS using SIM900. 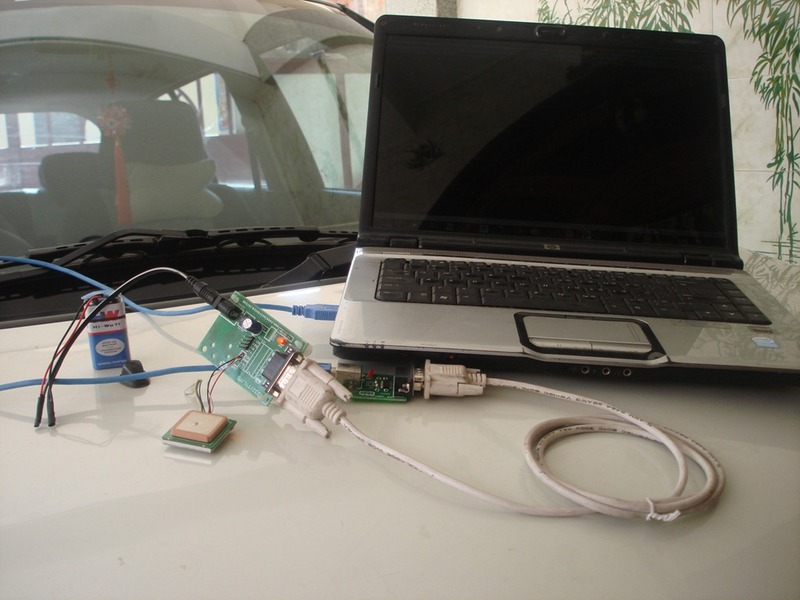 A terminal software like PUTTY is used to read out the COM port where GSM is connected to PC through USB-UART board. 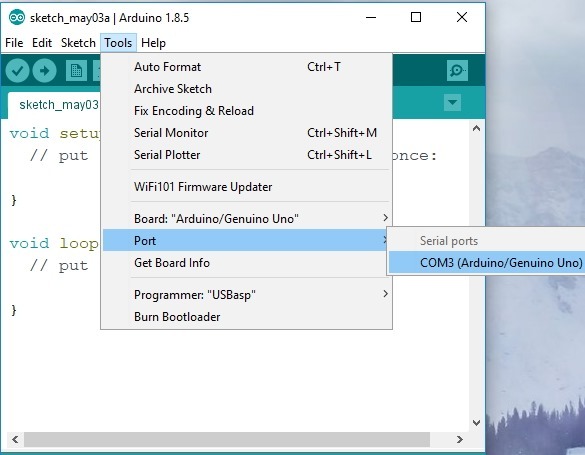 As you connect the USB-UART board to PC ,the PC allots a COM port which can be seen under Device manager.Open the PUTTY terminal & set this to read the serial port. 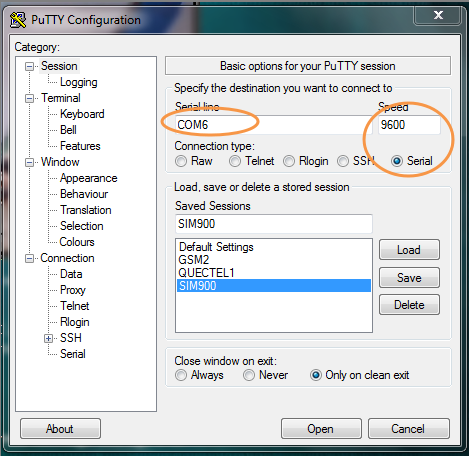 Open the Putty terminal & type in AT .If your modem settings & connections are fine you get an OK response from the modem. AT+CPMS command .This sets the Preferred Message Storage area. As seen above ,our modem returns all 3 message storage areas as SM , which refers to the Message storage area on the SIM card. The first SM specifies the message storage area that will be used while Reading or Deleting SMS. The second SM specifies the area that will be used when sending SMS from message storage or writing SMS to storage. The third SM specifies the preferred message storage area for storing newly received SMS. In our case ,SM is the preferredstorage area for all SMS functions , Read , Send & Receive. The mobile network operator’s service center number will be displayed. 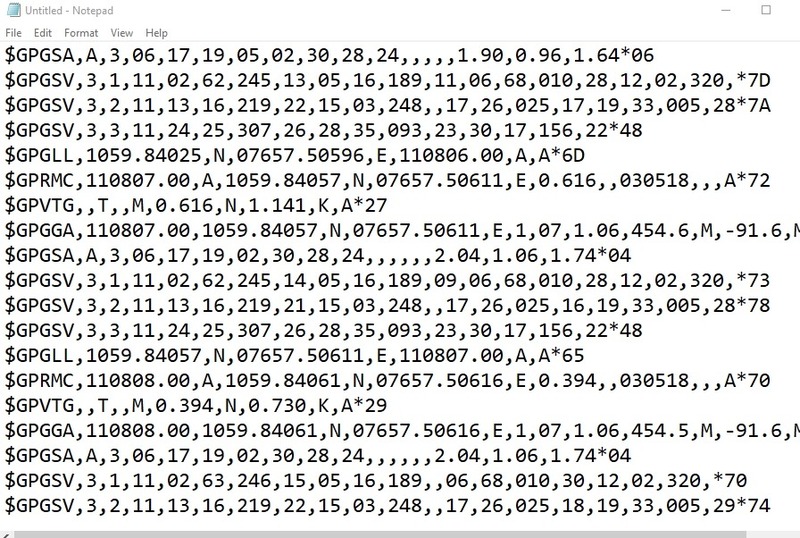 The number 145 in +CSCA is the address type .145 refers to International number starting with +. 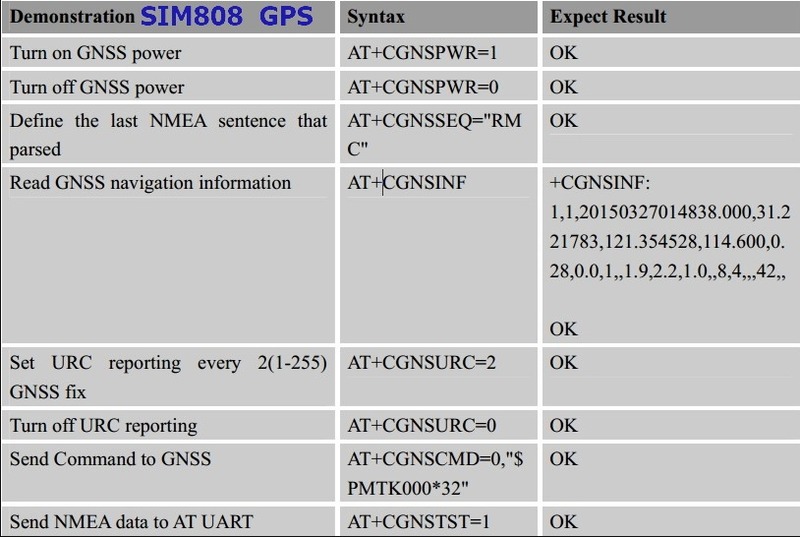 reports the SMS modes supported by the GSM. 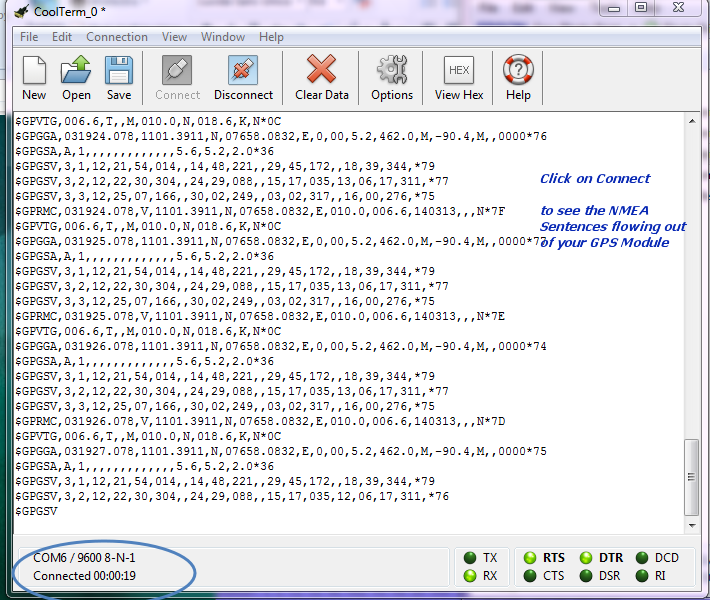 0 is for Text mode & 1 is for Protocol Data Unit (PDU) mode.Our modem reports (0,1) supporting both SMS modes. If the modem responds with “OK” this text mode is supported. It is possible to send only simple text messages in this mode. The Modem responds with + CPMS: followed by Used space & Maximum space. In our modem there are currently 2 messages in memory (used space ) & maximum storage capacity is for 30 messages. The modem responds with a list of all messages in the storage area. 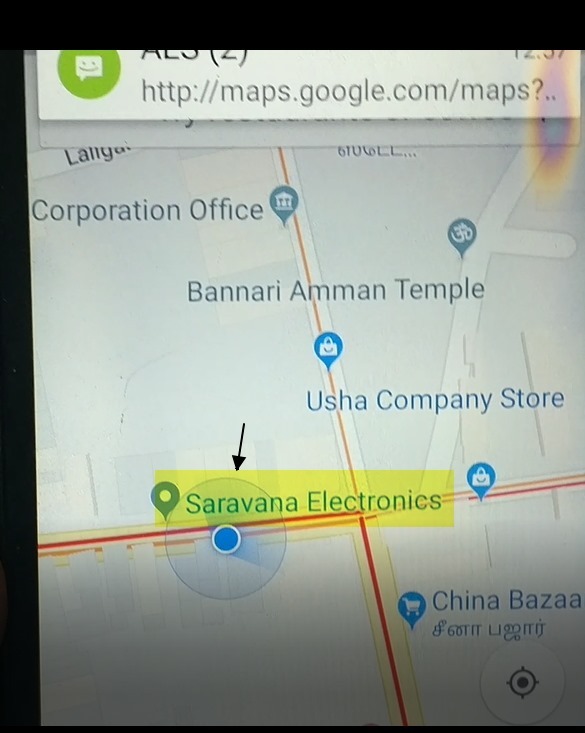 “+91xxx “ is the phone number from where the message originated. 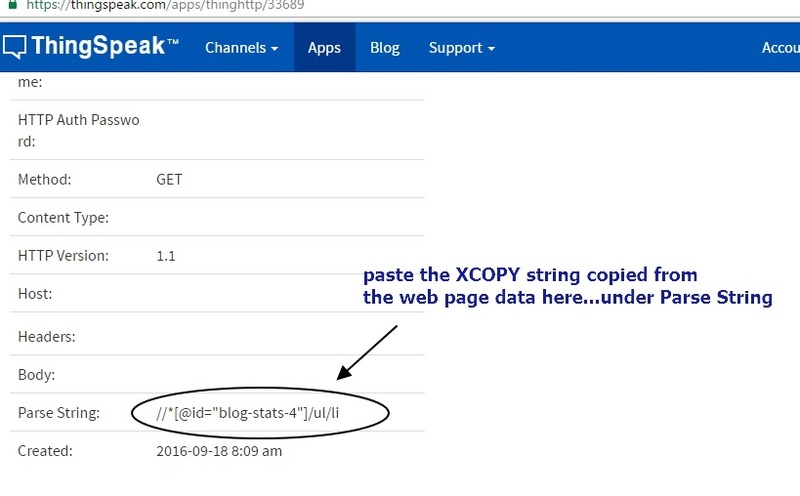 “,” Next column is the reference number of the message.Generally this field is empty. Finally the actual message in text format is displayed. 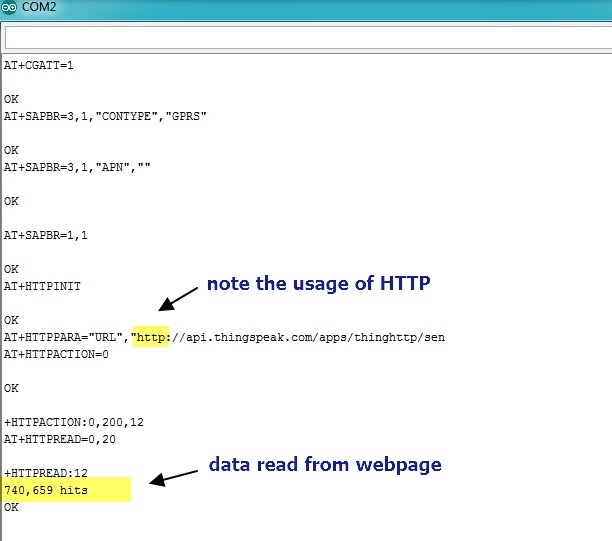 To list out a particular message , use the CMGR command with the index number of the message to be read. To delete a message use CMGD command with the index number of message to be deleted. AT+CMGD=1 to delete the message at index 1. You can issue the command AT+CMGL=”ALL” to see that the message at index 1 is deleted. To delete all the messages in the storage area there is no such command like AT+CMGD=”ALL”. Use the following notation to delete all messages. 1 to 30 can be assigned to index parameter & all five flag values from 0 to 4 are supported. Flag value 1 – Delete all READ messages ,ignoring value of index. Flag value 2 – Delete all READ & SEND messages. Flag value 3 – Delete all Read,Sent & Unsent messages. Flag value 4 –Delete all messages. You can see from above screen shot that all messages are deleted after issuing AT+CMGD=1,4. 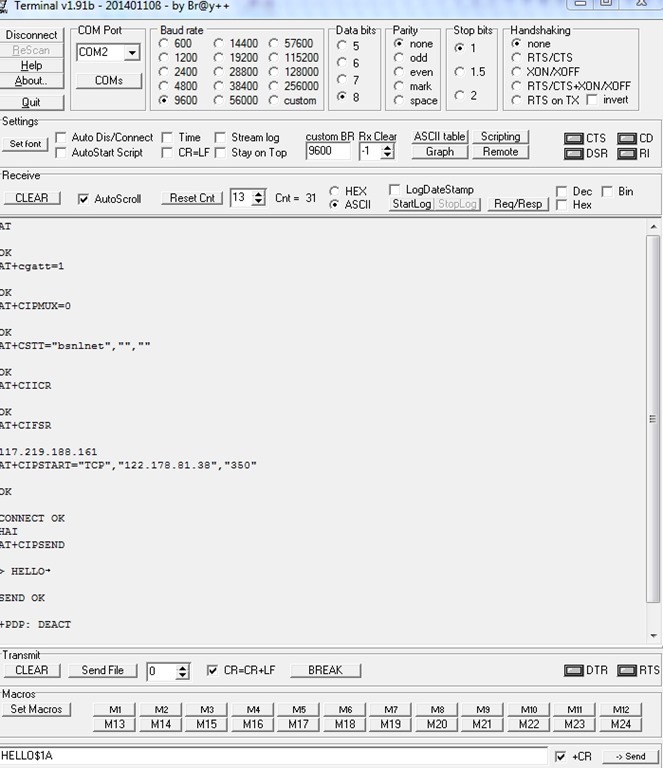 AT+CNMI – New message indication to Terminal Equipment TE. 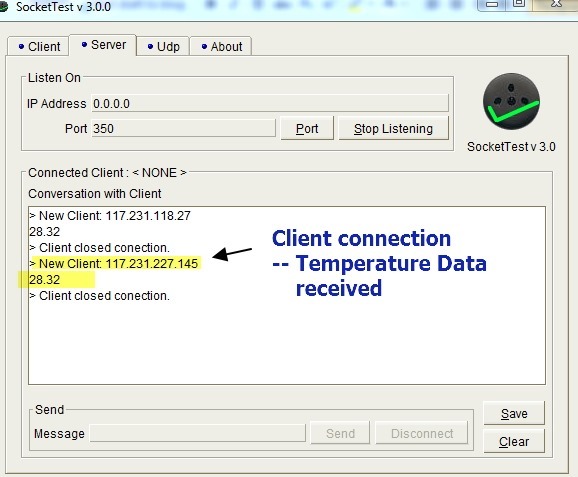 Selects procedure how receiving of new messages from the network is indicated to the TE. 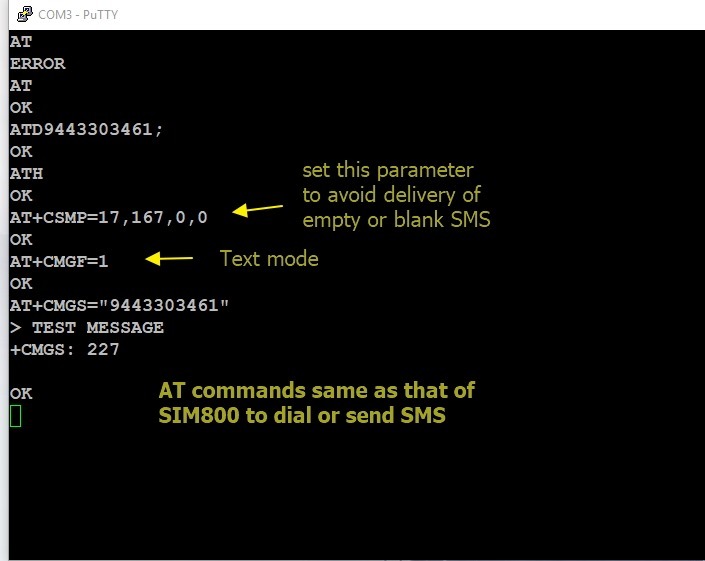 The following command sets the indicators for receiving an SMS message. AT+CNMI=1,1,0,0,0 Set the new message indicators. <mode>=1 discard unsolicited result codes indication when TA – TE link is reserved. 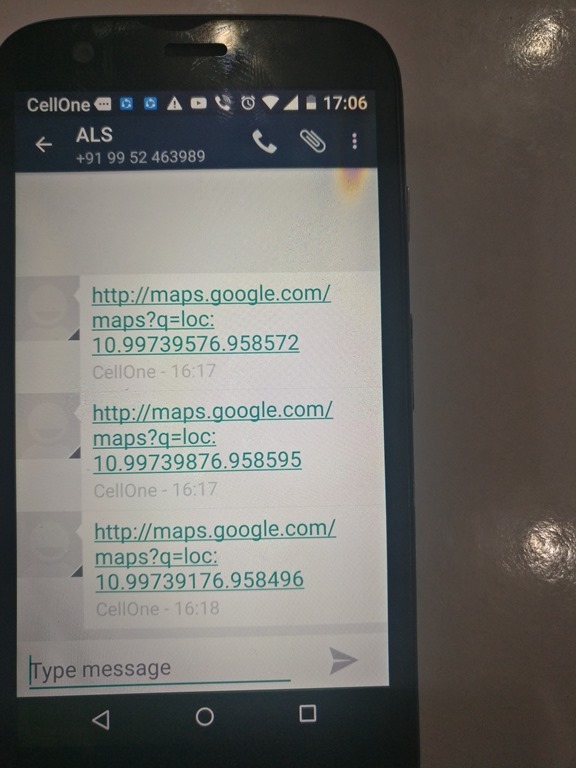 <mt>=1 SMS-DELIVERs are delivered to the SIM and routed using unsolicited code. <bm>=0 no cell broadcast message indications are routed to the TE. <ds>=0 no SMS-STATUS-REPORTs are routed. <bfr>=0 Terminal Adapter ( TA) buffer of unsolicited result codes defined within this command is flushed to the TE (Terminal equipment). The following command saves the SMS settings. Once the SMS commands have been saved, the initialization commands do not need to be sent again until they are changed. toSave SMS settings. This may take up to 10 seconds. 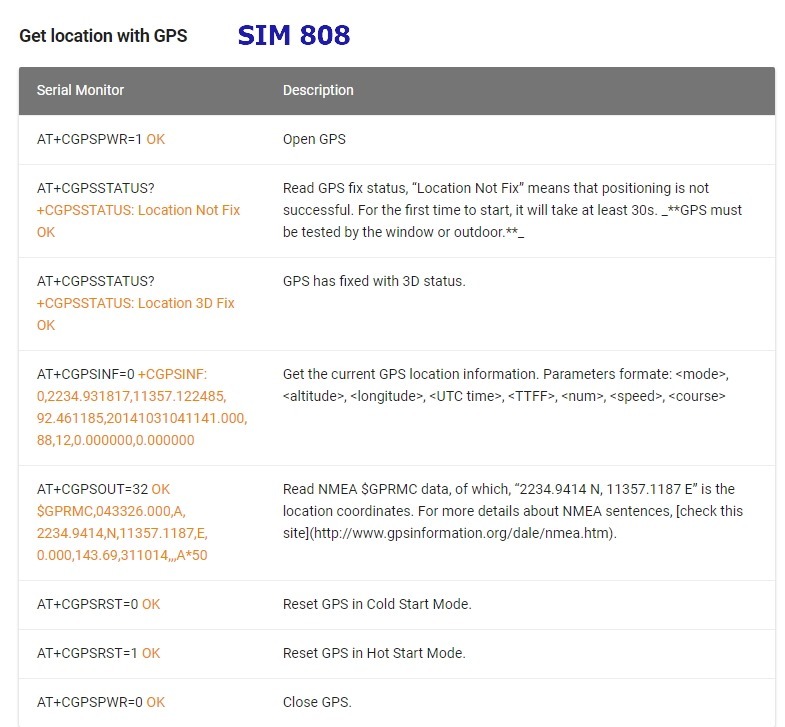 There are numerous GPS modules available in the market. 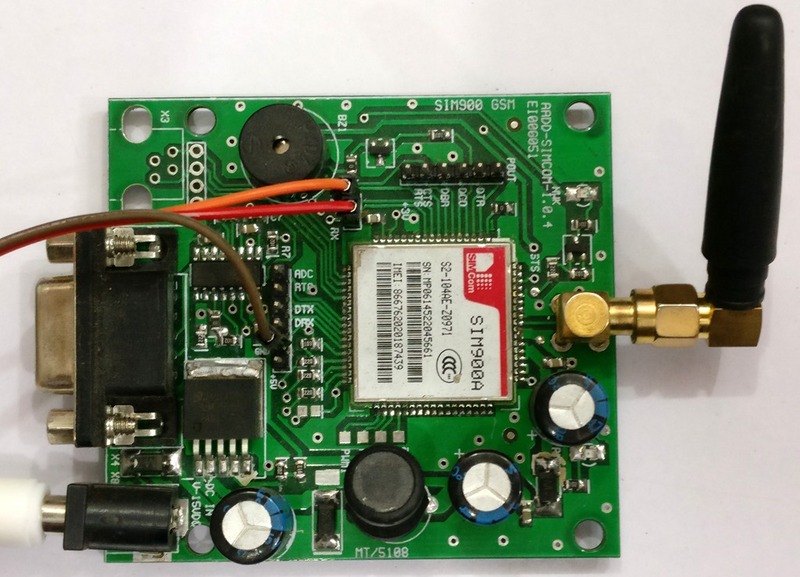 In this post, I am going to use GPS-634R module manufactured by SKYTRAQ , a Taiwan based leading GPS Chipset manufacturer. 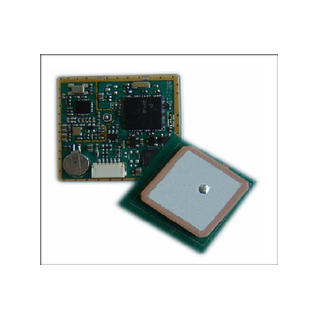 GPS-634R is a highly integrated smart GPS module with a ceramic GPS patch antenna. The antenna is connected to the module via an LNA – Low Noise Amplifier. 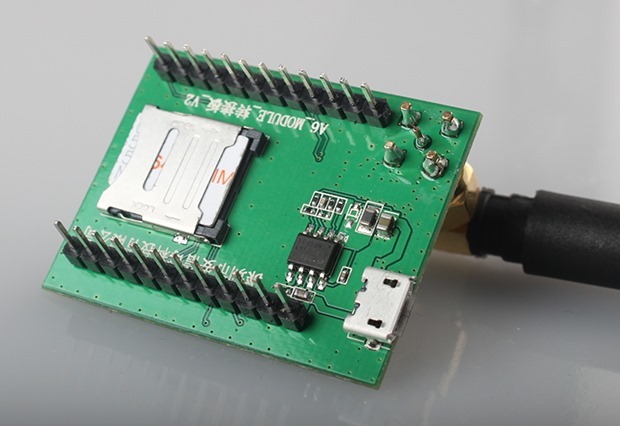 The module is with 51 channel acquisition engine and 14 channel track engine, which be capable of receiving signals from up to 65 GPS satellites and transferring them into the precise position and timing information that can be read over either UART port or RS232 serial port. 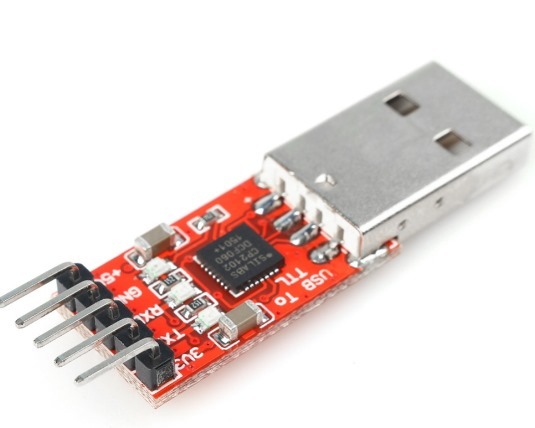 Both of the LVTTL-level and RS232 signal interface are provided on the interface connector, supply volt is 3.6 to 6v DC.The module can be used with your Desktop PC, Laptop, or a microcontroller. It supports the NMEA 0183 protocol, as do many GPS modules. 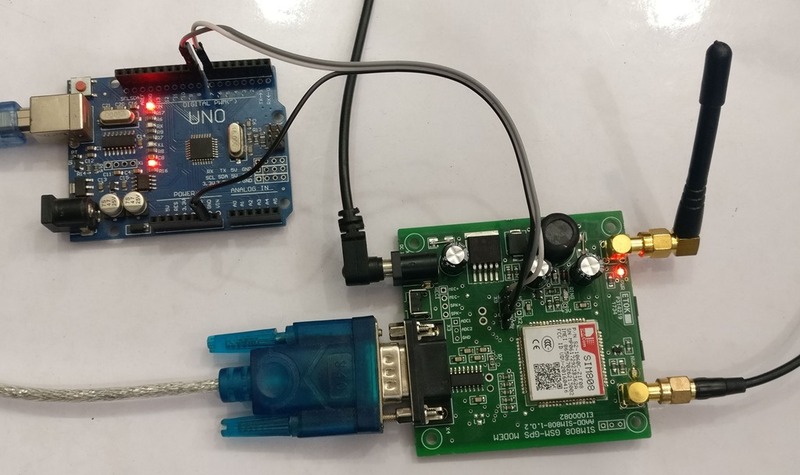 This board will allow you to use a standard 12v AC adapter and a 9 pin Serial cable to connect the GPS module to your PC or Laptop.In Laptops you don’t have a Serial port.Make use of an USB to UART board to connect to USB port. 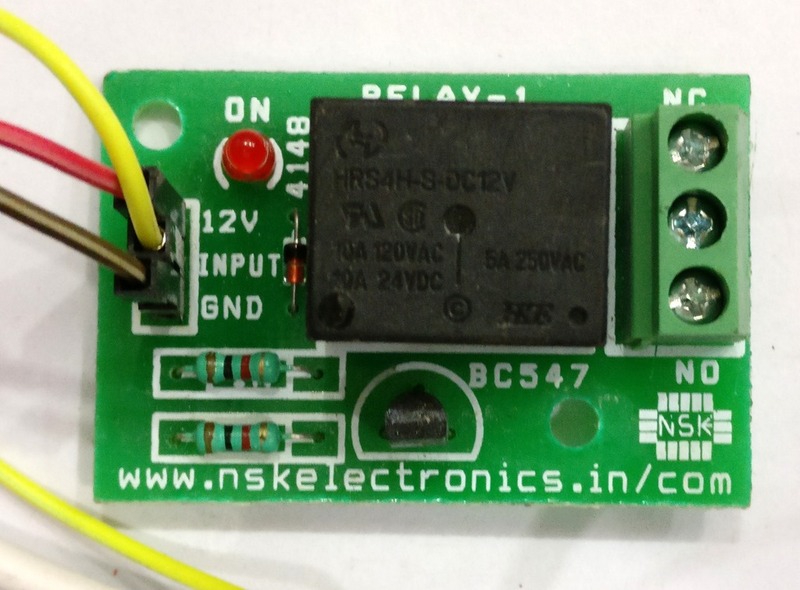 We shall use a board made by NSK Electronics ,which uses a CP2102 Siicon Labs USB –UART IC, a reliable one. Connect the GPS module to the breakout board.Only we need 3 wires Vcc (pin 1),GND (pin 2) & the TX (Serial Data out). 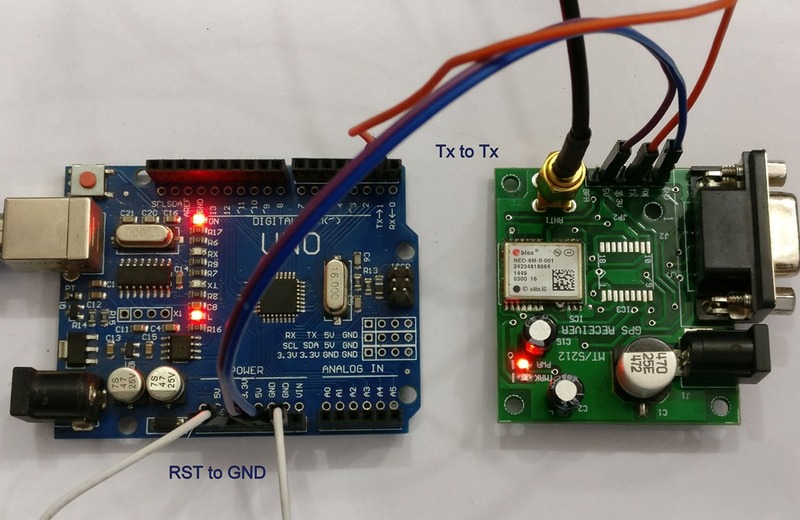 The TX wire should be connected to Rx pin on the board. 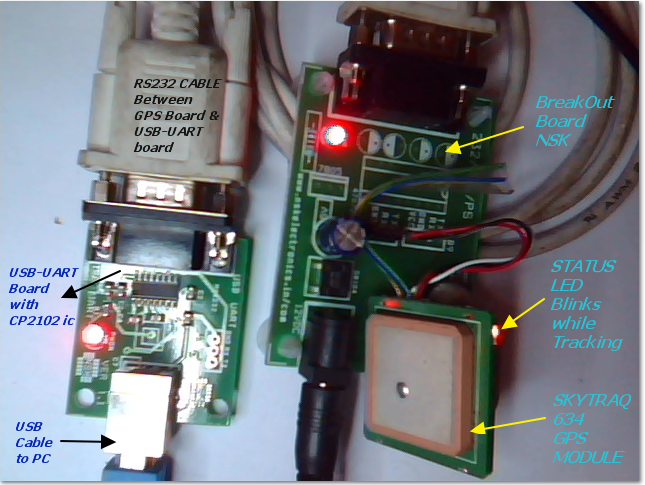 The 9 pin D connector of the breakout board is connected to the USB-UART converter using a Serial cable (straight one not cross).The USB connector of USB-UART board is then connected to the Laptop using a A-B USB cable. Provide a 12v DC adapter to the break out board.The power LED will glow. 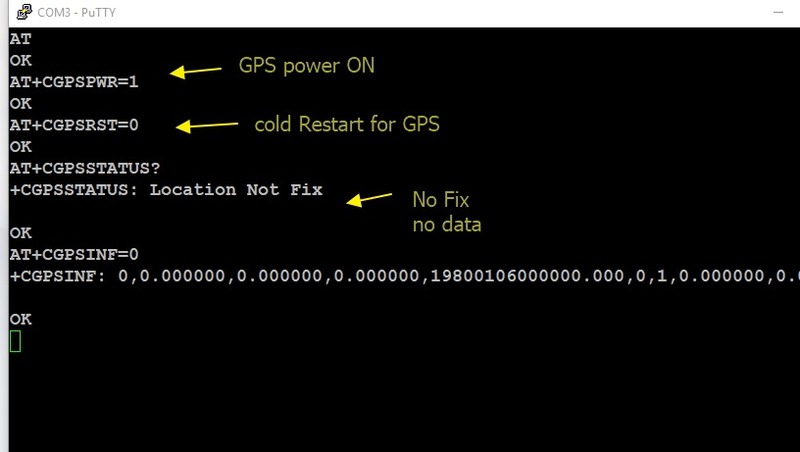 At the bottom of the GPS Module a status LED glows.This LED glows still (always On) in Non-Fix mode & starts blinking once the GPS module is outdoor and has started tracking. 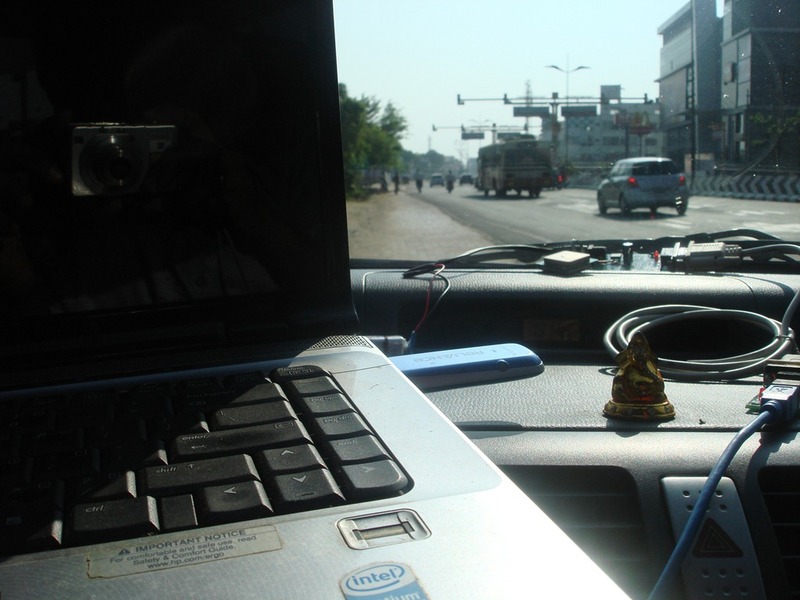 We shall make use of a Terminal Software COOLTERM to read out the COM port where GPS is connected. 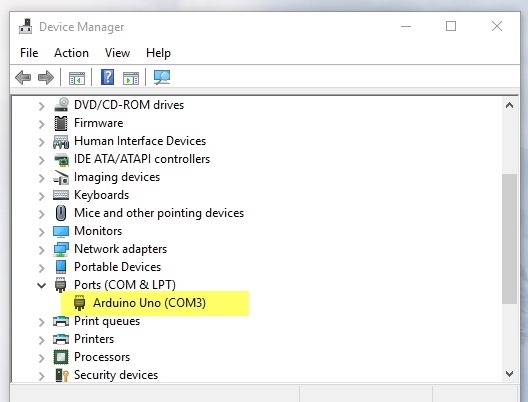 Open up the Device Manager & note down the port number allotted to the USB-UART board. 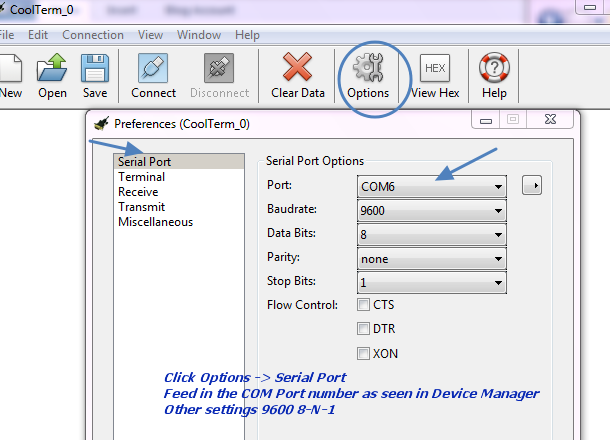 Click on Options & then under Serial port select the port allotted to your USB-UART board as seen in the Device Manager.The other settings are Baud Rate –9600, Data Bits – 8 , Parity –None & Stop Bits – 1 (9600 8 N 1) . 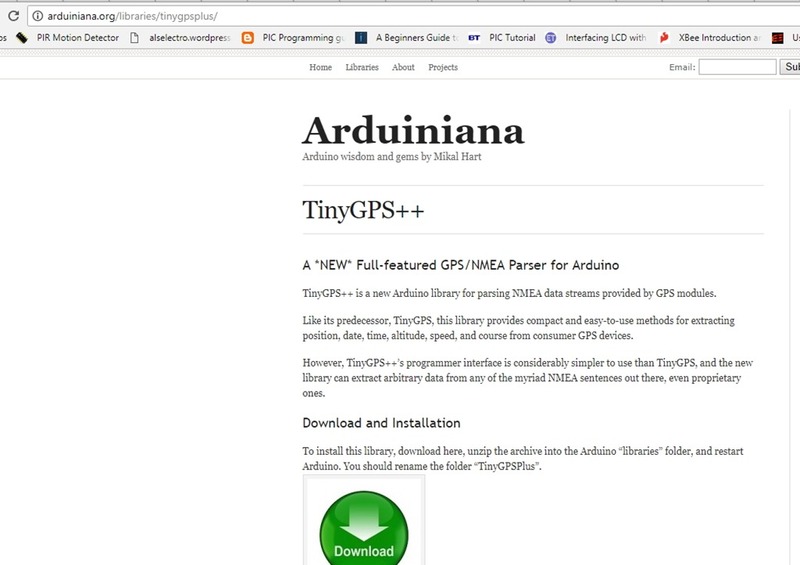 If you click CONNECT button you can see your GPS in action & NMEA Sentences flying out. The $GPRMC Sentence is the most useful one and contains the position fix. GP is the Prefix for GPS followed by RMC which is Recommended Minimum Sentence. All data are separated by Commas. 054006.999 is the current time in Greenwich Mean Time (not your local time). In this example it is 05 Hours 40 Minutes 06 Seconds & .999 MilliSeconds. 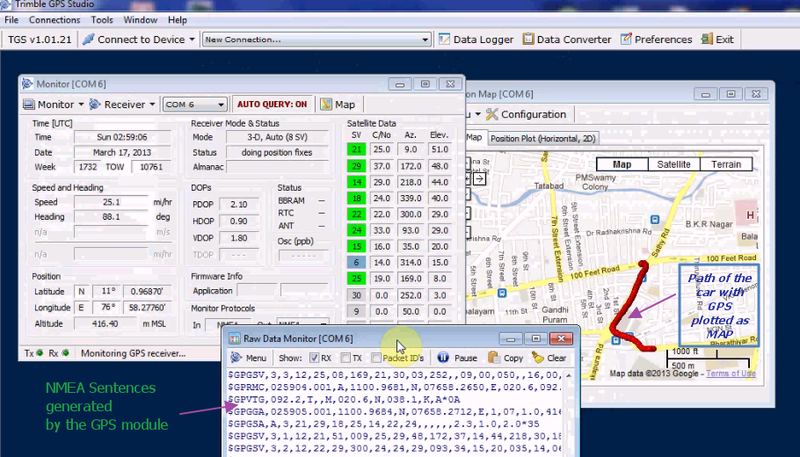 Next 4 pieces of Data are Geo Location Data. 07657.4794,E -> Longitude 76 Degrees ,57.4794 decimal minutes EAST. Next 2 commas indicate Empty field.One is for Time in secs since last DGPS updated & the other is DGPS station ID number.In this example both fields are empty. 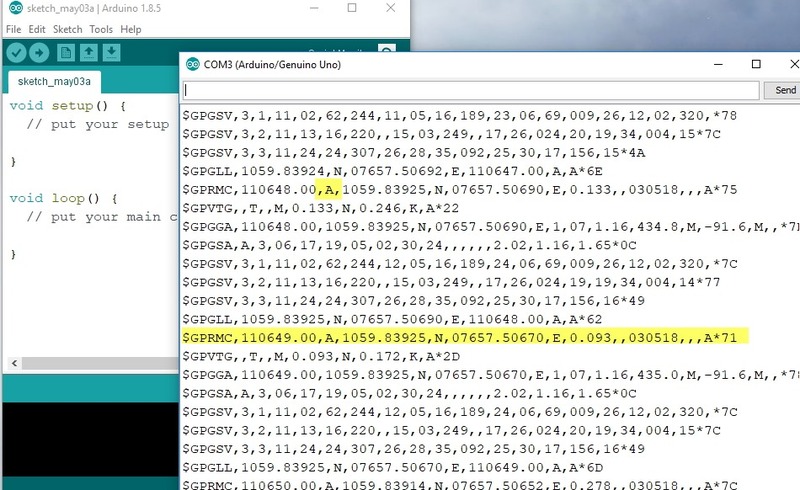 Finally a checksum data is presented which starts with an “*” symbol followed by 2 Hex digits. Now we shall use a GPS STUDIO Software called TRIMBLE to view the MAP. Click Disconnect in the COOLTERM window to close the port. If Windows Firewall blocks Trimble , click Allow Access to start TRIMBLE. 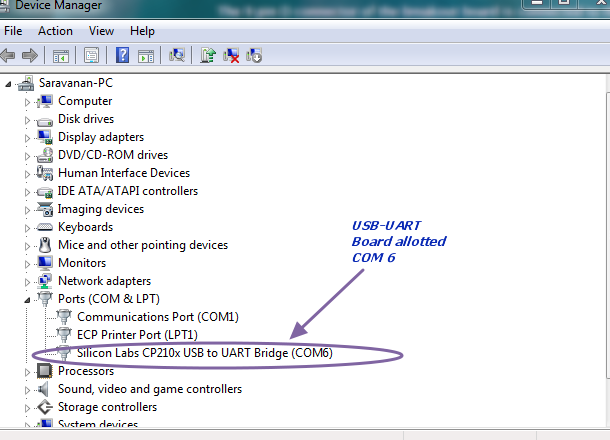 Under New Connection Select the port COM6 (allotted to USB-UART). 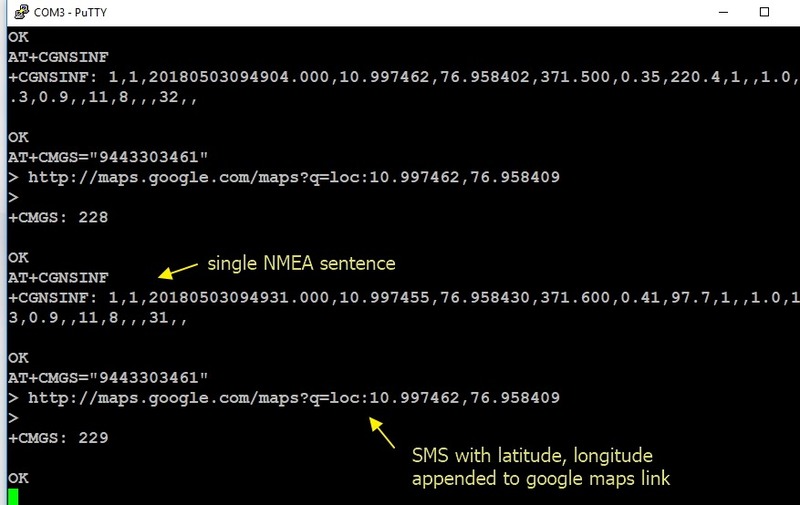 Now you can see the individual data like Latitude,Longitude,Date ,Time , etc.. are extracted from the NMEA sentences & displayed in their respective boxes. 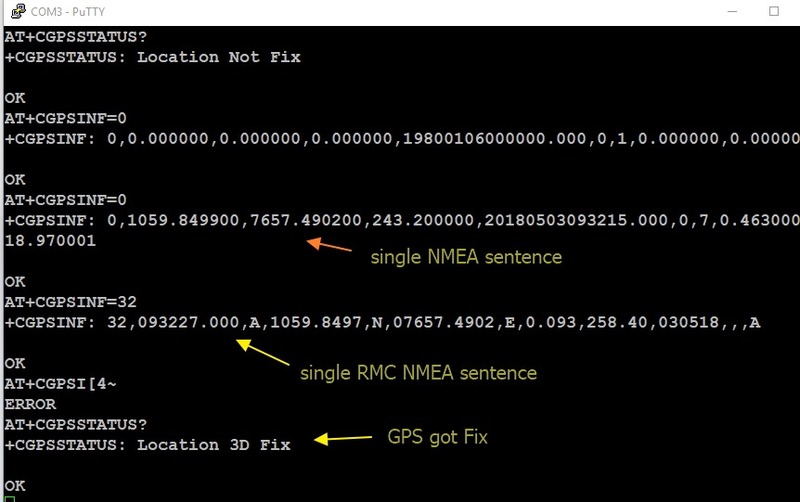 To see the NMEA sentences click Monitor – > View RAW Data. 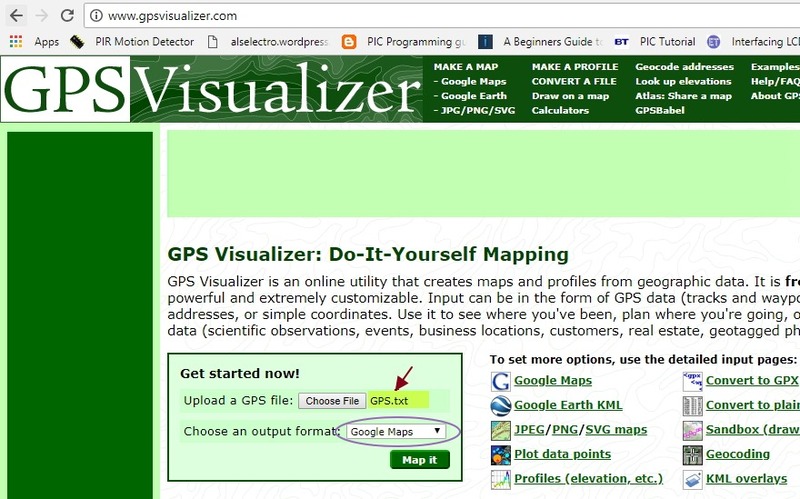 To view the MAP click on Map button at the right top of the Monitor screen. 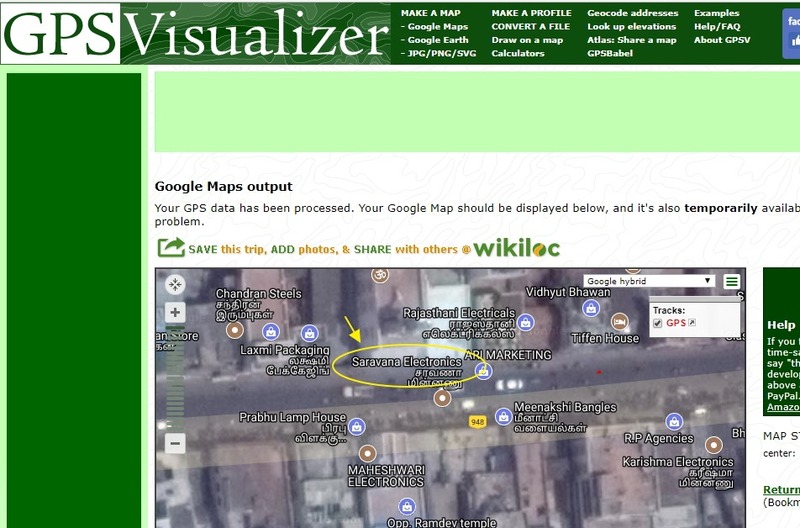 The position of the GPS is seen as a Red Dot .To see Satellite or Terrain Views you can click on the respective buttons. 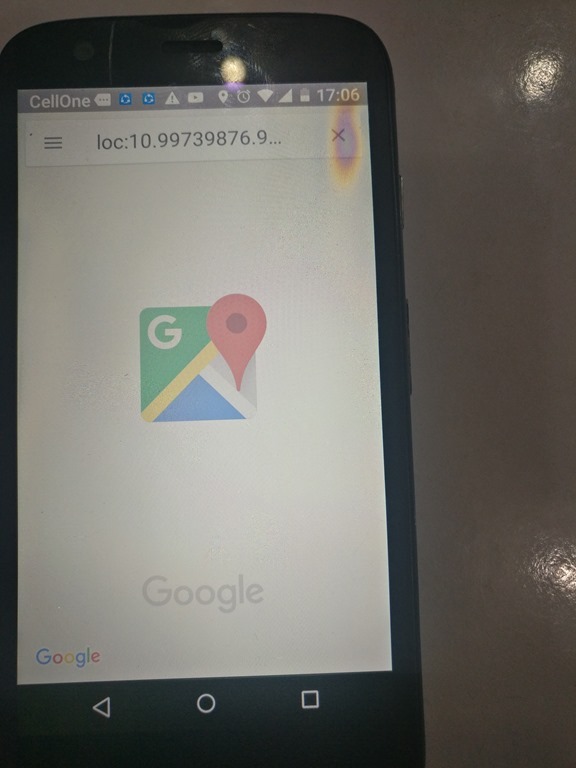 If the GPS is fixed in a Car , the Red dot will move on the map following the movement of the Car. Now let us take the GPS setup into a Car. This is the whole setup we are taking into a car. 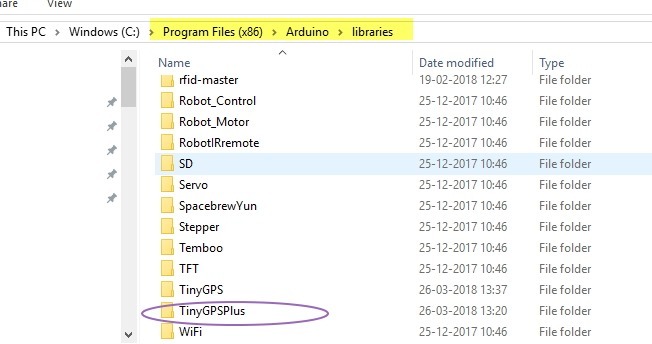 A 9V battery is enough to power up the GPS module.The GPS module is connected to Laptop using an USB-UART board.Trimble Studio is started and the COM port of USB-UART board is entered into the port settings of Trimble Studio. 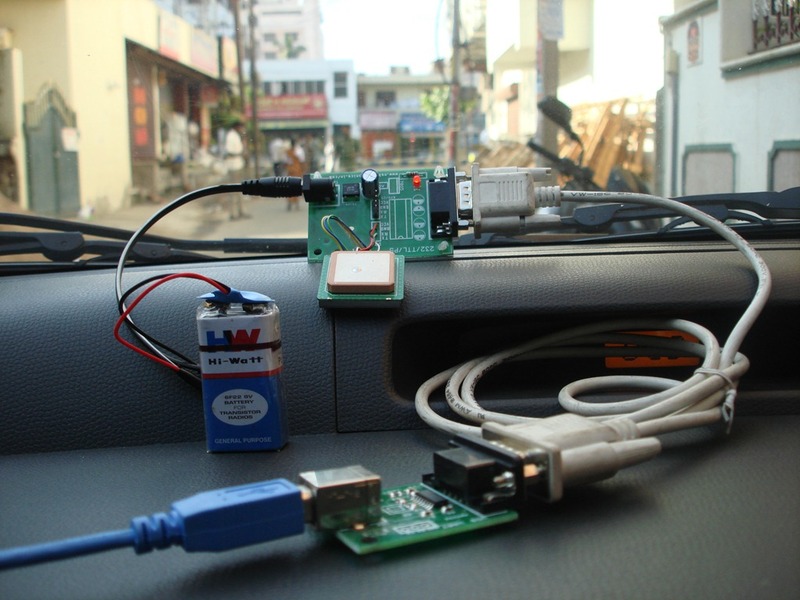 The GPS Module is placed at the front of Dash Board to get a clear sky view. A Reliance Data card is used for providing Internet connectivity. 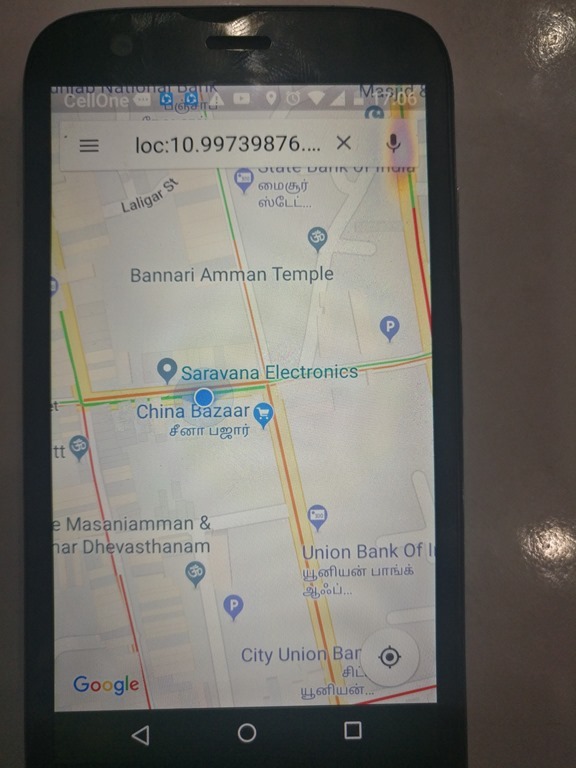 Below is the screen shot of the Map plotted according to the movement of the Car.